We're open year round, so if the weather isn't cooperating, please make sure to dress warmly. As you can see our guest golfer today is Mr. Tom Troiani of Niles, IL. 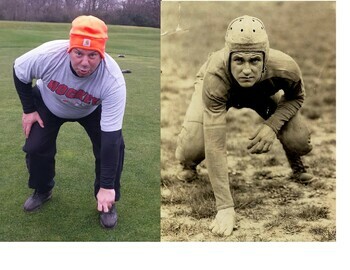 Here properly displayed as an old leather head football player playing golf on our course. He's dressed in multiple layers and a jacket on the side (not pictured). Please note the old school helmet with bright orange to signify to other golfers "Please don't hit the golf ball at me". Tom is hoping to break 100 today. ( Picture of Tom Troinani courtesy of Tom Cierniak). I couldn't help but find a picture of a classic football player from 50 years ago. Note the similar posture. Golf is not that much different than other sports.